Coombeshenge after being leveled in 2018. Note from ISGA: Recently the famous outdoor schoolyard created by ISGA Leadership Council Member, Susan Humpries, was leveled to the ground as a result of changes in school governance and policy. The authors of this guest blog followed the school closely and wrote a book about the space in 2002, called The Schoolyard as a Classroom: a Yearround at Coombes School. They share their thoughts on this news below. Coombes School outside London is world famous for its schoolyard and its outdoor-focused educational model. Visitors and researchers from around the globe have followed the school since 1971, when founder, Susan Humphries, and her staff first created a child-friendly landscape on the school grounds. It was a place that attracted children’s curiosity and desire to explore - a place where young people learned about life as well as school subjects. Coombes School is well-known across the globe. researchers have valued its educational work for decades and numerous international visits to study the school have taken place. In 2011, Susan Humphries was awarded an Honorary Doctorate at the Swedish University of Agricultural Sciences (SLU) because of her approach to creating outdoor environments rich potential for play and creative school work, which has positioned the school at the forefront of education, internationally. A treehouse at Coombes in years past. The same tree, after the treehouse was torn down in 2018. But it has not been easy to anchor the outdoor approach and to keep using the grounds for teaching and learning purposes, even though Susan Humphries continued to advise the school for many years after her retirement. During its prime, everything in the grounds was created, managed, and maintained to meet children at their own levels in every way. Fruit trees were planted and pruned so that the fruits could be picked by a very young child. Houses were built in the trees where you did not have to be afraid to spoil and waste. There was an amphitheater, huts, art installations, micro-biotopes, ponds, sheep, and hens. Coombes even had its own Stonehenge — “Coombeshenge”. It was part of an ingenious system of rocks and blocks from all corners of Britain that formed a Geology Trail used for play and learning. This was just one piece of the world that school created—its own world made up of different places with different characters. In November, there was always a fire burning in the school grounds. The children would build a model of London using cardboard boxes painted in happy colours. A fire would be started in the baker's house on Pudding Lane and would spread until the whole box-town burned down, with the children bearing witness to the devastation. A phoenix is also created and burned, becoming a pile of ashes. "Everything has to come to an end", the teachers would say, as the children watched the fire. Everything goes under sooner or later, but this is not necessarily bad or dangerous. Death is a prerequisite for life. Something new will sprout from the ashes. Do children understand this? "No, maybe not now—but later in life they will," the teachers reasoned at Coombes. We all carry memories that sooner or later are brought to life again, perhaps when we return to a place or a context that revives the experiences we have had before. The place brings the memories to life: the place is the memory. This idea was the basis of the philosophy and approach to outdoor education that the Coombes' staff and parents, with head teacher Susan Humphries at the forefront, developed and practised nearly every day. But now an era has gone to the grave. When we recently visited Coombes School the new head teacher explained that over the last five years, the school has gone through some very turbulent times. Due to governmental pressures on the expected quality of teaching and learning, the school environment, which was once a top priority, has had to take a back seat. In the autumn of 2017, the school was turned into an Academy, with new management and many new staff. The school had to break a downward spiral and the new head apparently wants to reboot from a clean slate. The grounds are no longer used as much as in the past and the holistic approach to learning in and from a living outdoor environment has nearly disappeared. The local authority was also asked to make a safety check and found that some of the school’s well-known stone sculptures were a hazard. At the beginning of 2018, these stone arrangements were leveled to the ground. The head teacher told us that the school could not manage the costs of securing the blocks in a safe way. We don’t know how big the risk was in reality, but it was difficult for even the machines to roll over the stones. The artists that created the sculptures were not informed what was to happen to their work, nor was Mrs. Humphries. The amphitheater is also closed and the tree-houses have been torn down. Trees and shrubbery have been cut to allow staff to monitor and control the children. "Now they can play safely", says the new head teacher. While we clearly understand that something must be done when an outdoor environment lacks sufficient care and maintenance for years, we are devastated that the Coombes School will no longer serve as an international model. 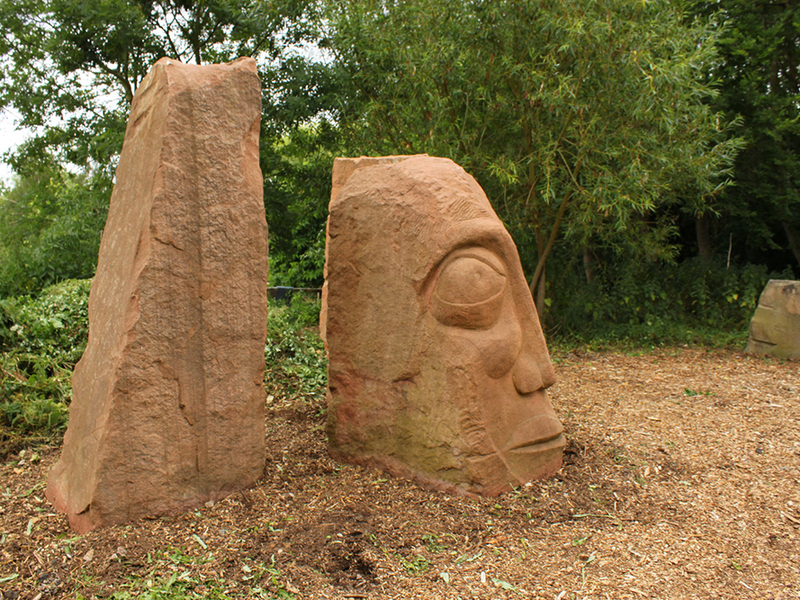 Hand-crafted stone sculpture at Coombes School, in 2010. The same stone sculpture, after being leveled in 2018. Leveling almost 50 years of development in a few days is a clear indication of what can happen today, in a social climate where fear and short-term thinking are spreading. What happened at Coombes is a sad example of how historic values can be erased because of a lack of understanding, or even no respect at all, for why the outdoor environment is necessary for children. Democratic values, the belief in the power of collective action, and the basic conditions for children's development (that were so common in the past) seem to be wiped away like annoying insects. The Roman Empire fell, but a new world sprouted from the ash. This parallel to what has happened at Coombes might be far-fetched, but seeds are sprouting from the ash here too: the memory of the achievements created by Susan Humphries and her colleagues live on and are rooted in many places around the world. Coombes's guiding moto, "sharing and caring", has to live on. But now with the root of this holistic view on children’s learning and development gone, there is no longer a natural source for this thinking. Great values will be lost if forces and cultures created over decades can be erased in just a few days. It is time for an international gathering to defend and strengthen the impact and importance of the outdoor environment as a teaching resource. A single enthusiast can achieve a lot, but enthusiasts alone are not enough. We need stable and supportive systems to guarantee that the outdoor environment in schools and pre-schools are designed and used as resources of great importance to children´s schooling and over-all development. Local community work is as important as national and international agreements and guidelines. The International School Grounds Alliance, for example, now has a golden opportunity to act on both national and international levels. But remember we can all contribute. Let’s make sure the Phoenix rises from the ashes and flies again! For more information about the inspiring curriculum and innovative approach used successfully at Coombes for decades, see: The Coombes Approach: Learning through an Experiential and Outdoor Curriculum by Susan Rowe and Susan Humphries (Continuum, 2012). Titti Olsson is a Science Journalist at Movium Think tank at SLU, Alnarp, Sweden. She is a specialist in outdoor environments for children and young people and is the author of several books on the theme since the early 1990’s. She is also the Chief Editor for the Magazine STAD. Petter Åkerblom is is a Landcape Architect specialized in urban outdoor environments that promote contact with nature, play, and active living for children and young people. He is Senior Lecturer in Landscape Architecture at the Department of Urban and Rural Planning, SLU, Uppsala. His PhD is focused on school gardening ("Learning by gardening"). During the years 2006-2017 he was the National Coordinator for outdoor urban space for young people at Movium Think tank, SLU. He is also an ISGA Leadership Council Member.